Well we will have to wait for another day and another trial for an American jury to rule on the “necessity defence” for direct action to prevent climate change. On Friday, five activists – known as the Delta 5 – failed in their bid to allow a jury to determine whether their blockage of a crude by rail train was an act of “necessity defence” against climate change. Patrick Mazza, one of the Delta 5 who had represented himself, had argued that direct action was needed to “supply some kind of shock to the system, to move the system away from the corporate influence under which it is right now”. In an earlier hearing the judge had indicated that he would allow the “necessity defence” to be used. The judge eventually ruled that, after hearing two days of evidence, that the defendants had failed in their efforts to persuade him that they had “no reasonable legal alternative” but to block the crude by rail train in a bid to stop climate change. 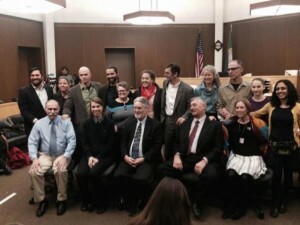 The judge did, however, praise the Delta 5 – Patrick Mazza, Abby Brockway, Mike Lapointe, Jackie Minchew, and Liz Spoerri – for being “part of the solution” on climate change. It was back in September 2014 that the Delta 5 blockaded a crude by rail train carrying highly explosive Bakken crude in the BNSF Delta Yard in Everett, Washington State. They were eventually released and charged with “criminal trespass” and blocking a train. With the jury unable to determine a “necessity defence”, in the end on Friday, the Delta 5 were convicted of trespassing but were acquitted of obstructing a train. All five were spared jail as they received suspended sentences. There has been a mixed response to the verdict. The Guardian reported it as a “blow to environmental campaigners”, as the activists failed in their attempt to use the “necessity defence”. The jurors were sympathetic to the defendants with some hugging each other after the verdicts.